As many collectors have likely faced, stacks of cards can become a chaotic mess that can both clutter your home and risk damage to your card collection. 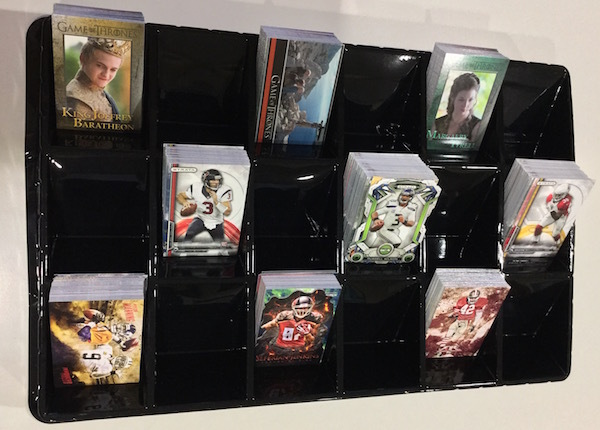 While there is not a perfect answer that fits every collector, the Ultra Pro Card Sorting Tray is an intriguing option, especially for those that deal with set collecting or regularly sort large quantities of cards. It won't clean up for you, but the Ultra Pro Card Sorting Tray makes sorting a much more manageable task. Inexpensive and lightweight, the Ultra Pro Card Sorting Tray features three rows of six slanted card spots for a total of 18 compartments. Although the tray cannot support any real weight, the thin plastic design retains its shape while still allowing some flexibility. Each tray is angled on both sides of the compartment, allowing stacks to be easily moved from front to back. The additional space in the compartments also makes adding and removing the cards a very easy. The cards do stick up above the height of the compartment, so if you have one stack leaned forward and the stack in front is leaned back, the cards will be resting on one another. While it obviously depends on the card stock in question, each compartment can accommodate a stack of cards just over two inches deep (2-1/8"). For me, that worked out to roughly 115 standard base cards per spot. 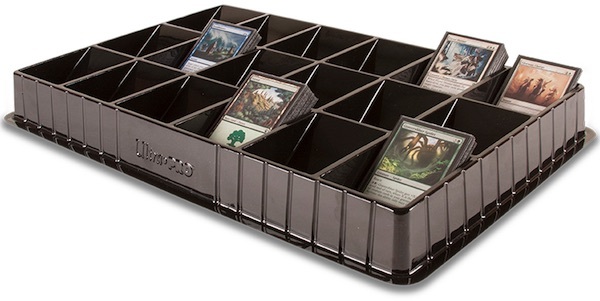 So with 18 compartments, the tray can handle approximately 2,070 cards at one time. Given the price point, it would be easy to keep several on hand if you are regularly breaking cases of card products or have a ton of cards to sort. The trays can be stacked when not in use. One thing I did notice while using the tray is that it attracts dust pretty quickly. A simple fix I found was just to wipe down each compartment with a microfiber cloth in between uses. So, in summary, the Ultra Pro Card Sorting Tray offers a legitimate and inexpensive solution to sorting larger quantities of cards. The tray is sturdy enough to handle a full load of cards, but the thin plastic compartments are very soft and do not damage the cards. As it is not collapsable or intended to support a large amount of weight, it must be stored somewhere that will not put any pressure on the shape. And, as mentioned above, multiple trays can be easily stacked when they are not in use. These trays are essential to me. I also like the BCW trays, which appear a bit more solid and have 24 compartments. I only recommend these for Gaming Cards with rounded edges. For sports cards with sharp corners, the slots are not wide enough. At least in the Ultra Pro sorting tray I bought, Which was very similar, but looked slightly different. After 5 or 10 cards in each compartment, the slots were wide enough, but the first few cards in each compartment were getting pinched at the bottom due to rounded bottom of the slot. Actually, mine might have been BCW, so maybe this one is better? But something to watch out for. Darin � While I cannot be certain what version or brand you have, I can tell you that the Ultra Pro tray I reviewed has ample width and the bottom of the compartments are not rounded.